Budva is the party capital of Montenegro, a country that many people have never even heard of. Montenegro used to be a part of Serbia until its recent split, and it is traveled primarily by Serbians, Russians, and Ukrainians. Budva is surprisingly very built up, and taking a stroll along the beach can be quite pleasant. There are several different beaches which are lined with bars, and an ‘old town’, which also has many bars and restaurants. During the day there is quite a bit to do, and the nightlife does not end until the early hours of the morning. Budva has much more of a holiday vibe than a backpacker vibe. Many people who you will meet are on a short holiday or are there working during the peak season. Many people in Budva are friendly enough when approached, however, typically do not have the “we met an hour ago and are now best friends” mentality that is common with seasoned backpackers. Don’t get too put off by this though, as many travelers to Budva are still looking to have a really good time! As mentioned before, Budva is surprisingly quite built up. A great selection of hotels can be seen along the beach for a couple of miles. In addition, there are some hostels for the more budget minded backpackers. 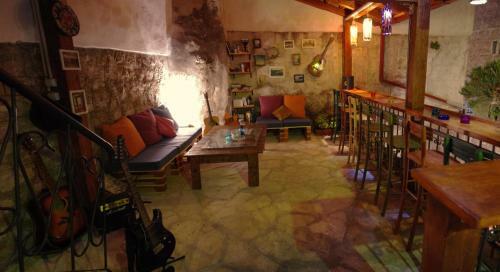 There aren’t really any party hostels of sorts, but some of the hostels have a comfortable and chill vibe. This is the most popular hostel in Budva as it is nestled right in the old town, and has a much more upbeat vibe than its competition. This is honestly the best part about Budva and was the reason that we ended up extending our trip. This is just a 5 euro and 20-minute boat ride from the city center and it’s completely worth it! Plaza Ploce features a huge swimming pool with a swim-up bar and endless tables where daily foam parties take place. For people who want to leave the madness, there is a beach with many lounge chairs to hang out. The music and the vibe here is amazing! This beach is about 5 minutes from the ‘old town’, and amazing to explore as the trail wraps around huge cliffs. This beach is much more relaxed than Plaza Ploce, but there are still a couple of bars, good music playing, and many people on the beach. For people who would like a day off from the foam parties, this is a really solid option. This is by far the most popular club in Budva, and frequently hosts famous DJs when they come into town. This club is the biggest, however it is a bit more difficult to get to and also a bit more expensive. This club is very nicely located, plays very good music, and has a good design. Like a majority of the other clubs here, dancing unfortunately is not a big thing, as many people tend to hang out at their tables. The vibe nevertheless is quite good, and this club is easier to meet people compared to other clubs in the area. The best part about Sparta, is the diversity of travelers found here. These bars are a really good place to begin the night as there are a variety of them together in one large area outside of an old castle. It’s quite vibrant and is also a good place to either come with a group of friends or meet people. We recommend Citadela, as it has really good live music. This is a very popular thing to do while in Budva. Because Budva has mountains surrounding the sea and beaches and sports an overall beautiful landscape in general, it is the perfect place to go paragliding. There are several popular spots to go cliff jumping, conveniently located near Mogren beach, which is a good place to hang out before and/or after jumps. These cliffs are fairly high, so this is not for the faint of heart! For those who love to get fast and furious on the water, jet skis are available. For those who want a more casual day surveying the coast beach hopping, boats are the way to go. For everyone who never wants to grow up (we certainly don’t), you can see large water slides just as you enter into Budva. This is a good activity for those who are children at heart. Bus is the most common way of traveling to Budva. The two most popular direct bus routes are from Dubrovnik and Belgrade. Any other bus will most likely connect in one of these two cities. Tivat airport is the closest airport to Budva. If flights are sold out here, Podgorica airport is another option. Book your travel plans early! If you don’t things quickly sell out and you will be stuck paying higher prices. Eat street food. Prices at restaurants can be pricey if you are on a budget. Did we miss anything in this article? Comment below to share your tips and tricks for The Ultimate Budva Montenegro Backpackers Party Guide.